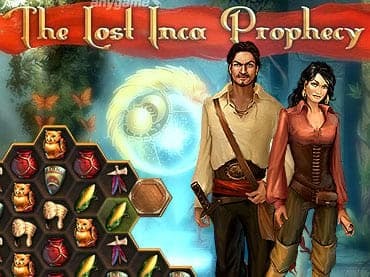 Travel to the New World and save the Inca civilization in this amazing match-3 adventure game! Acua has been having vivid dreams of the New World, and wakes up one morning to find she has drawn a map of a place she has never been to! Travel to the New World and help Acua prevent a devastating prophecy from occurring, restore demolished temples, and save the Inca civilization! The Lost Inca Prophecy can only be deciphered and understood using your Match 3 skills, and by following Acua`s mysterious dreams! Match colorful and exotic icons to stop a long-forgotten prophecy from befalling the Incan Empire in The Lost Inca Prophecy, an amazing match-3 adventure that lets you choose how to play! Free Game Features: - Immersive and mysterious atmosphere; - Multiple game modes; - An unique mix of match-3 and adventure; - Beautiful music and sounds; - Save the Inca civilization! If you have questions about The Lost Inca Prophecy game, please contact us using this form.